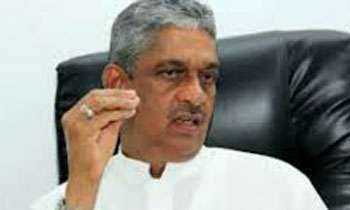 Responding to the statement made by President Maithripala Sirisena that the UNP founded by the late D S Senanayake was no more, Minister Sarath Fonseka said yesterday DS was engaged in a different kind of politics during his time. “Leaders such as former prime minister D.S Senanayake were engaged in a different kind of politics because he was striving to free the country from British rule. If one tries to engage in such politics that person will be labeled as a mad man. One must also remember that there are no Bandaranaikes in the SLFP today. The UNP was led by several leaders such as J R Jayewardene, Ranasinghe Premadasa and D B Wijetunga. If someone tries to become another D S Senanayake it will be a joke,” the minister told a media briefing. “The statement that the UNP of the late D S Senanayake is gone makes me laugh." When asked by journalists about allegations that four ministers had links with RAW, the minister said no one can accuse any minister of having connections with RAW just because they talk of an alleged plot to kill the President. “The talk about four ministers connected to RAW was popped by the statement made by the Hindu journalists that the ministers spoken about a RAW plot to kill the President. One cannot label ministers as RAW agents just because they talked to this journalist. Associating with RAW is an offence,” he said. People do know the real history. He didn't even understand what MS meant about .having people like you in party still RW is being a leader . SF, you have understood what Sirisena said was wrong. He meant the quality of the UNP and the leadership etc.but, not the politics. Sorry, you are not matured enough to understand politics. Yes, President is right, if DS were the leader of UNP right now, you would not definitely have been accepted as a Member of the party. Hon'ble DSS considered a father giving us Independence but you remain as an UNPATRIOTIC traitor aiding and abetting westerners to condemn SRI LANKA raising the very issue of WHITE-FLAG.